JukeRec is a cool and simple tool that grabs music from Internet Radio station streams and makes it into audio files for your personal music collection. If you want to save some money while enriching your digital library this is the program for you - versatile and easy to use. 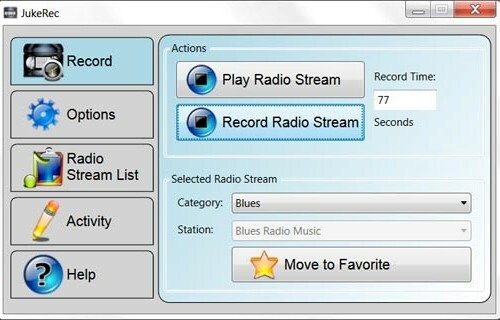 JukeRec is a program able to stream and record Internet radio at high-quality. ...... To the existing stations you can add in the "Stream List" section any other stations you prefer. All the Music You Want - No Copyright Infringement Risk! Unlike when downloading music from torrent sites with JukeRec you can have your favorite artists stored on your computer without risking obnoxious copyright notices and lawsuit threats from the RIAA. Recording music with JukeRec is totally legal. Whenever you like what you hear you can hit the "Record" button (for a time interval you can specify; by default the "Record entire stream" option is selected) and save the stream as an audio file(s) in the directory you will also select. JukeRec is a simple streaming and recording tool, perfect for even the most sophisticated music tastes. Play multimedia files effortlessly in seconds! Qweas is providing links to JukeRec 1.5.0 as a courtesy, and makes no representations regarding JukeRec or any other applications or any information related thereto. Any questions, complaints or claims regarding this application JukeRec 1.5.0 must be directed to the appropriate software vendor. You may click the publisher link of JukeRec on the top of this page to get more details about the vendor.